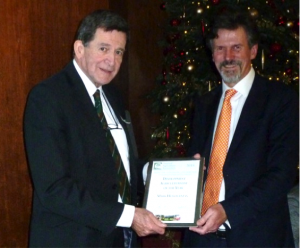 Mark Holderness was honoured at the recent Annual General Meeting of the Tropical Agriculture Association (TAA) in London, The TAA awarded Mark as ‘Development Agriculturalist of the Year, 2018’, recognising his outstanding contribution to agricultural development. In particular the TAA cited his work in championing the views of farmers and their organisations, placing them at the centre of the international agricultural research agenda. Mark gave a short presentation talk and thanked all involved for this honour and the recognition it provided to all involved in GFAR. The award for Young Development Agriculturalist was awarded to JB Madhukesh, for improving the incomes and livelihoods of farmers in Karnataka, India, through business partnerships linked to capacity building services. Awards of merit were awarded to Terry Wiles, in recognition of outstanding support to TAA’s London and South-East Branch programme, and to the All-Party Parliamentary Group on Agriculture and Food for Development. And to Brian Sims, in recognition of outstanding contributions, as author, book reviewer and technical editor, to the improvement of the TAA’s Journal Agriculture for Development. The TAA is a partner in GFAR and all are welcome to join this prestigious professional association, concerned with the role of agriculture for sustainable development throughout the world. To learn how to become a member, click here.